Vegetables and fruit to grow at school. Avoid summer holidays. One problem with vegetables and fruit is that many of them are ready for harvest in mid to late summer, just when schools go on summer holidays. To help with that problem we have listed some fruit and vegetables that are ready from early June and to the beginning of the school holidays. We have also listed a few that are ready for harvest from early September onwards which can stand some neglect in the summer holidays. Click here for the vegetable list, click here for the herb and fruit list. Some of the things you may need. First, dig the soil so that it is crumbly. Some of the children can bring in trowels from home to dig the soil over. If it's dug over to the depth of a trowel it will be OK for many vegetables. It's better to be dug to a spade's depth but that's not essential. If the soil is too hard to dig with a trowel, there's no choice but to dig the area over with a spade at first. 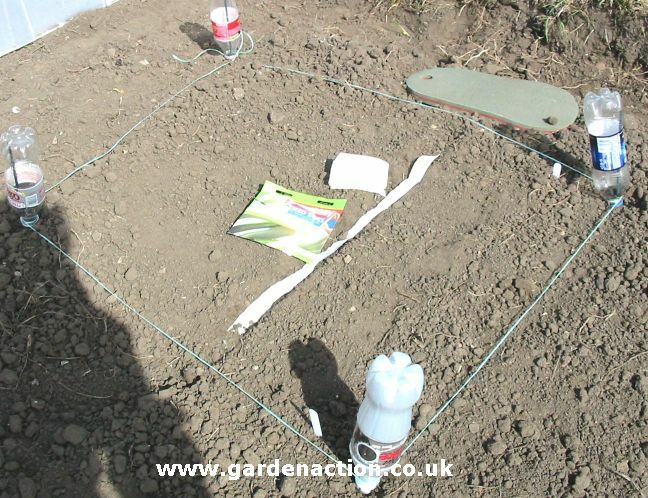 Identify the area to be dug by putting sticks in the ground at the four corners and then tying string round them to enclose the area to be dug. Make sure the ends of the sticks are covered with something (a plastic bottle for example) to avoid anyone damaging their eyes. Soil with fertiliser on it The plants need food and there are two ways of doing this (better is both). Apply a long lasting fertiliser to the soil immediately after digging. 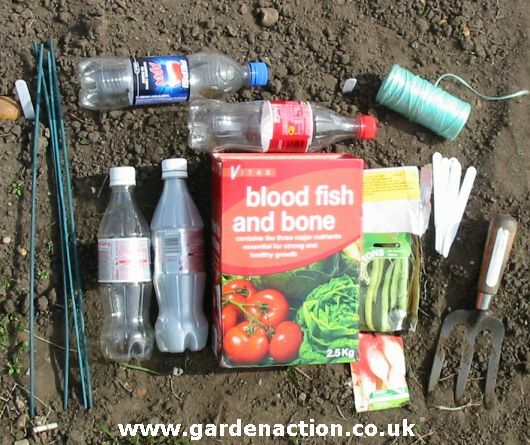 Use something like blood, fish and bone which is available at most of the diy and nursery stores. 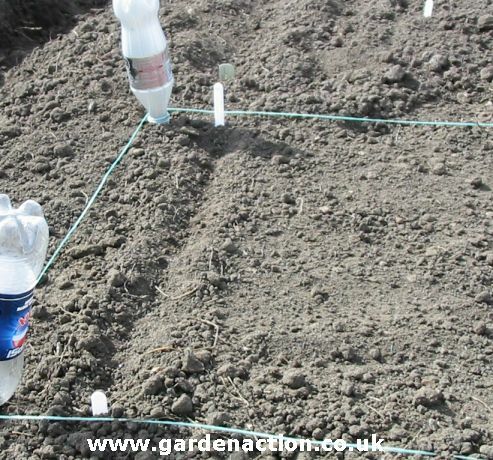 Apply a handful of this per square metre to the surface and lightly dig in to the soil surface. This will last the plants a couple of months or more. 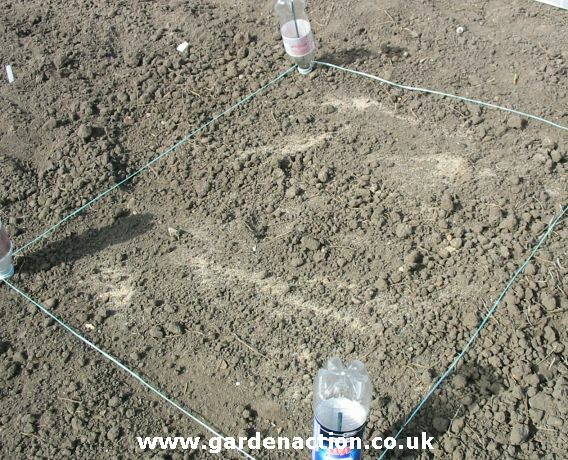 The other way is to sprinkle a general fertiliser such as Growmore on the soil. This will give instant good to the plants but will only last a week or so. Only apply a general fertiliser when the seedlings have emerged, not when sowing the seeds. First, read the instructions on the seed pack. Different seeds need to be planted in different ways. With a trowel, dig out a shallow indentation in the soil in a straight line. Then sprinkle the seed in the indentation at the spacing advised on the seed packet. Cover the seeds with soil and pat it down gently with your hands. Write on two markers the name of the seed and the date planted. Place markers (the little white plastic sticks in the picture) at both ends of the seeds. There is a very good reason for sowing the seeds in a straight line and marking the beginning and ends of the seeds. 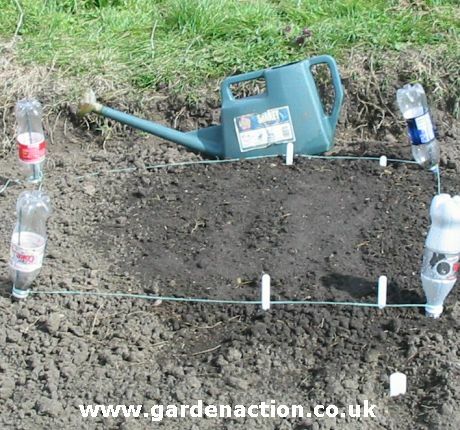 When the seeds emerge in a few weeks time, so will weed seedlings, all over your newly dug vegetable plot. Even to experienced eyes, it is difficult to differentiate between a weed seedling and a vegetable seedling! But if the seeds are in a straight line and the beginning and ends are clearly marked then it will be much easier to identify the straight line of seedlings. Some seeds are very fine and this makes them difficult to sow at the correct spacing. If you sow too many then unwanted pests may be attracted to the seedlings when you thin them out - this applies particularly to carrots. One solution, shown in the picture, is to use strips of paper with the seeds stuck into them. These seed strips are available at many seed merchants, including Suttons. The picture above shows us laying the seed strip in the indentation in the soil. 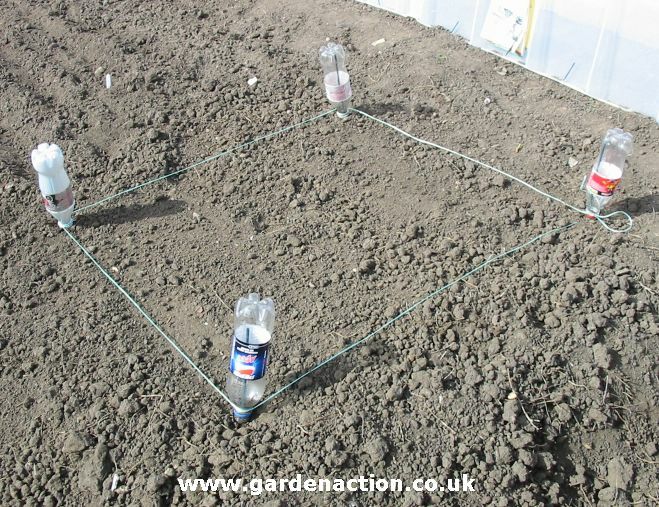 Simply cover the strip with soil and then firm it down gently with hands. A watering can will be essential throughout warm times. But the seeds should also be watered in immediately after sowing if the conditions are at all dry. This will help germination. Don't just lightly wet the soil surface, give them a good watering. But do it gently so that the force of the water doesn't wash the seeds awasy.